A playful, irreverent counting book that celebrates the special things we know and love about Australia. Start with 'one little nipper', then count the pies, potaroos and blue wrens up to 'twelve kelpie legs' - in this friendly and amusing book you can count from one to a thrillion! the bowerbird's treasures, his bottle tops and pegs. How many potaroos? How many pies? How many gum leaves? How many flies? Now count the strawberries on that luscious pavlova. Quick! Count the lamingtons... Oh! None left over! 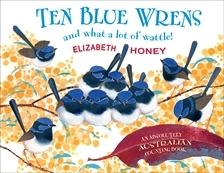 I so enjoyed the humour and rhyme in Ten Blue Wrens. I also loved that Honey chose some quintessential but not so obvious elements of Australian life. For instance, we read of "Two straight fingers for a goal in Aussie Rules" and "12 hardworking kelpie legs". Honey's beautiful illustrations were made with acrylics sponged onto stencils. The front endpaper shows part of this process - a brilliant idea that will definitely intrigue young artists. My favourite illustration though is the front cover, replete with fluffy, chubby blue wrens and fluffy golden wattle - gorgeous! It's great to find a counting book with an Australian flavour. I think Ten Blue Wrens and what a lot of wattle! would make a thoughtful gift for a child overseas, and teachers will grab it to add to their resources on Australian Studies. Kids will just grab it to enjoy! Find more Children's Book Reviews at www.thebookchook.com by clicking Reviews in the right sidebar. Ooh, this book sounds really good. I might see if I can hunt it up in the bookstores before school goes back. These sorts of books are fun for kids in all levels of primary school. @Mr VI agree. Picture books and graphic novels really appeal to visual learners too! @KateCoombsAh Book Aunt, what can I say? The shoes is usually on the other foot!